Financial Analyst, Christopher Ram has expressed surprise at the reported 0.9 per cent inflation announced by the Minister of Finance in his 2014 Budget Speech. In his budget presentation the Minister announced that prices remained stable because of GPL’s stable rates as well as close monitoring of fuel prices and tax. Ram however, noted that following their visit, a team from the International Monetary Fund (IMF) in a Press Release dated December 19, 2014 reported that inflation for the year was expected to come in around 3.5 per cent. In a brief telephone interview with Kaieteur News yesterday, Ram noted that IMF has access to the country’s data and statistics as well as to technical officers in the Government. 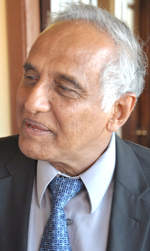 Ram said that if the reported inflation rate reported by the Minister is correct, then Guyana has a lower rate of inflation than all its major trading partners and economies, including the United States of America. Ram noted that even by the most favourable measure, the exchange rate of the Guyana Dollar depreciated against the US Dollar by 0.86 per cent in 2013. He observed too that exports declined, imports declined and the wholesale and retail trade also declined, while collections from VAT, which is borne by the consumer, rose. Ram drew attention to Appendix IV – Consumer Price Index (Inflation) Statistics attached to the Budget Speech and to the items in the CPI Basket, Footwear and Repair and Furniture which are reported to have declined by 14.2 per cent and 4.6 per cent respectively. He reminded that statistics are maintained by the Guyana Bureau of Statistics and the Bank of Guyana both of which come under the Minister of Finance. Ram said he would like to see more independence being demonstrated by these two bodies with the freedom to publish relevant and timely statistics outside of the strictures of the Ministry of Finance. Ram said he noted on occasions that these agencies publish their statistics shortly after the mid-year and annual budget speech. Commenting on the reported growth in GDP, Ram expressed concern whether the Bureau of Statistics has the capacity to carry out a reasonably accurate measure of some sectors of the economy. He said that he doubts that the Bureau has a handle of the cross-borders transactions with neighbouring countries or the capacity to measure with a reasonable degree of reliability the hard-to-measure categories, such as real estate activities, construction and tourism. Again drawing attention to the Finance Minister’s speech, Ram said that he doubts very much the Minister’s statement that hotel occupancy in 2013 was 76 per cent. He reminded that occupancy rates did not even reach that level during World Cup Cricket in 2007. Ram also questioned the 200,000 visitor arrivals in 2013 claimed by the Minister, a number contradicted by the statistics appended to the Speech. “In the constituent parts are reported inaccurately or defy all the available evidence and there is no independent technical validation of the numbers, doubts will be inevitable,” Ram said. Ram also expressed disappointment that the Bureau has not been able to publish the results of the Census carried out since September 2012.